In physics, the Navier–Stokes equations (/nævˈjeɪ stoʊks/), named after Claude-Louis Navier and George Gabriel Stokes, describe the motion of viscous fluid substances. Navier–Stokes equations are useful because they describe the physics of many phenomena of scientific and engineering interest. They may be used to model the weather, ocean currents, water flow in a pipe and air flow around a wing. The Navier–Stokes equations, in their full and simplified forms, help with the design of aircraft and cars, the study of blood flow, the design of power stations, the analysis of pollution, and many other things. Coupled with Maxwell's equations, they can be used to model and study magnetohydrodynamics. The Navier–Stokes equations are also of great interest in a purely mathematical sense. Despite their wide range of practical uses, it has not yet been proven whether solutions always exist in three dimensions and, if they do exist, whether they are smooth – i.e. they are infinitely differentiable at all points in the domain. These are called the Navier–Stokes existence and smoothness problems. The Clay Mathematics Institute has called this one of the seven most important open problems in mathematics and has offered a US$1 million prize for a solution or a counterexample. The solution of the equations is a flow velocity. It is a field, since it is defined at every point in a region of space and an interval of time. Once the velocity field is calculated other quantities of interest, such as pressure or temperature, may be found using additional equations and relations. This is different from what one normally sees in classical mechanics, where solutions are typically trajectories of position of a particle or deflection of a continuum. Studying velocity instead of position makes more sense for a fluid; however for visualization purposes one can compute various trajectories. In this form, it is apparent that in the assumption of an inviscid fluid -no deviatoric stress- Cauchy equations reduce to the Euler equations. The left side of the equation describes acceleration, and may be composed of time-dependent and convective components (also the effects of non-inertial coordinates if present). The right side of the equation is in effect a summation of hydrostatic effects, the divergence of deviatoric stress and body forces (such as gravity). All non-relativistic balance equations, such as the Navier–Stokes equations, can be derived by beginning with the Cauchy equations and specifying the stress tensor through a constitutive relation. By expressing the deviatoric (shear) stress tensor in terms of viscosity and the fluid velocity gradient, and assuming constant viscosity, the above Cauchy equations will lead to the Navier–Stokes equations below. An example of convection. Though the flow may be steady (time-independent), the fluid decelerates as it moves down the diverging duct (assuming incompressible or subsonic compressible flow), hence there is an acceleration happening over position. A significant feature of the Cauchy equation and consequently all other continuum equations (including Euler and Navier–Stokes) is the presence of convective acceleration: the effect of acceleration of a flow with respect to space. While individual fluid particles indeed experience time-dependent acceleration, the convective acceleration of the flow field is a spatial effect, one example being fluid speeding up in a nozzle. as it was in the general continuum equations and in the incompressible flow section). the stress is Galileian invariant: it does not depend directly on the flow velocity, but only on spatial derivatives of the flow velocity. So the stress variable is the tensor gradient ∇u. the stress is linear in this variable: σ(∇u) = C : (∇u), where C is the fourth-order tensor representing the constant of proportionality, called the viscosity or elasticity tensor, and : is the double-dot product. Both second viscosity ζ and dynamic viscosity μ need not be constant – in general, they depend on density, on each other (the viscosity is expressed in pressure), and in compressible flows also on temperature. Any equation expliciting one of these transport coefficient in the conservation variables is called an equation of state. is known as the Lamb vector. For the special case of an incompressible flow, the pressure constrains the flow so that the volume of fluid elements is constant: isochoric flow resulting in a solenoidal velocity field with ∇ · u = 0.
the stress is Galilean invariant: it does not depend directly on the flow velocity, but only on spatial derivatives of the flow velocity. So the stress variable is the tensor gradient ∇u. Dynamic viscosity μ need not be constant – in incompressible flows it can depend on density and on pressure. Any equation expliciting one of these transport coefficient in the conservative variables is called an equation of state. where 𝜈 = μ/ρ0 is called the kinematic viscosity. The higher-order term, namely the shear stress divergence ∇ · τ, has simply reduced to the vector laplacian term μ∇2u. This laplacian term can be interpreted as the difference between the velocity at a point and the mean velocity in a small surrounding volume. This implies that – for a Newtonian fluid – viscosity operates as a diffusion of momentum, in much the same way as the heat conduction. 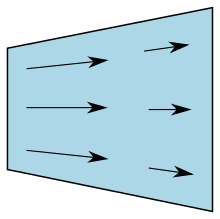 In fact neglecting the convection term, incompressible Navier–Stokes equations lead to a vector diffusion equation (namely Stokes equations), but in general the convection term is present, so incompressible Navier–Stokes equations belong to the class of convection-diffusion equations. The incompressible Navier–Stokes equations with conservative external field is the fundamental equation of hydraulics. The domain for these equations is commonly a 3 or less Euclidean space, for which an orthogonal coordinate reference frame is usually set to explicit the system of scalar partial differential equations to be solved. In 3D orthogonal coordinate systems are 3: Cartesian, cylindrical, and spherical. Expressing the Navier–Stokes vector equation in Cartesian coordinates is quite straightforward and not much influenced by the number of dimensions of the euclidean space employed, and this is the case also for the first-order terms (like the variation and convection ones) also in non-cartesian orthogonal coordinate systems. But for the higher order terms (the two coming from the divergence of the deviatoric stress that distinguish Navier–Stokes equations from Euler equations) some tensor calculus is required for deducing an expression in non-cartesian orthogonal coordinate systems. where ΠS and ΠI are solenoidal and irrotational projection operators satisfying ΠS + ΠI = 1 and fS and fI are the non-conservative and conservative parts of the body force. This result follows from the Helmholtz Theorem (also known as the fundamental theorem of vector calculus). The first equation is a pressureless governing equation for the velocity, while the second equation for the pressure is a functional of the velocity and is related to the pressure Poisson equation. with a similar structure in 2D. Thus the governing equation is an integro-differential equation similar to Coulomb and Biot-Savart law, not convenient for numerical computation. for divergence-free test functions w satisfying appropriate boundary conditions. Here, the projections are accomplished by the orthogonality of the solenoidal and irrotational function spaces. The discrete form of this is eminently suited to finite element computation of divergence-free flow, as we shall see in the next section. There one will be able to address the question "How does one specify pressure-driven (Poiseuille) problems with a pressureless governing equation?". The absence of pressure forces from the governing velocity equation demonstrates that the equation is not a dynamic one, but rather a kinematic equation where the divergence-free condition serves the role of a conservation equation. This all would seem to refute the frequent statements that the incompressible pressure enforces the divergence-free condition. It is desirable to choose basis functions which reflect the essential feature of incompressible flow – the elements must be divergence-free. While the velocity is the variable of interest, the existence of the stream function or vector potential is necessary by the Helmholtz Theorem. Further, to determine fluid flow in the absence of a pressure gradient, one can specify the difference of stream function values across a 2D channel, or the line integral of the tangential component of the vector potential around the channel in 3D, the flow being given by Stokes' Theorem. Discussion will be restricted to 2D in the following. Adopting continuous plate-bending elements, interchanging the derivative degrees-of-freedom and changing the sign of the appropriate one gives many families of stream function elements. Taking the curl of the scalar stream function elements gives divergence-free velocity elements. The requirement that the stream function elements be continuous assures that the normal component of the velocity is continuous across element interfaces, all that is necessary for vanishing divergence on these interfaces. Boundary conditions are simple to apply. The stream function is constant on no-flow surfaces, with no-slip velocity conditions on surfaces. Stream function differences across open channels determine the flow. No boundary conditions are necessary on open boundaries, though consistent values may be used with some problems. These are all Dirichlet conditions. The algebraic equations to be solved are simple to set up, but of course are non-linear, requiring iteration of the linearized equations. Similar considerations apply to three-dimensions, but extension from 2D is not immediate because of the vector nature of the potential, and there exists no simple relation between the gradient and the curl as was the case in 2D. where the test/weight functions are irrotational. Any conforming scalar finite element may be used. However, the pressure gradient field may also be of interest. In this case one can use scalar Hermite elements for the pressure. For the test/weight functions gi one would choose the irrotational vector elements obtained from the gradient of the pressure element. are measured in the non-inertial frame. The first term in the parenthesis represents Coriolis acceleration, the second term is due to centripetal acceleration, the third is due to the linear acceleration of K' with respect to K and the fourth term is due to the angular acceleration of K' with respect to K.
The Navier–Stokes equations are strictly a statement of the balance of momentum. To fully describe fluid flow, more information is needed, how much depending on the assumptions made. This additional information may include boundary data (no-slip, capillary surface, etc. ), conservation of mass, balance of energy, and/or an equation of state. In the example below we can assume to have a Newtonian fluid as well as having ρ and μ both be constant. Recall that mass continuity is simply the summation of the rate of mass in and the rate of mass out. Recall that ρ is a constant thus proving the divergence theorem above. This single equation together with appropriate boundary conditions describes 2D fluid flow, taking only kinematic viscosity as a parameter. Note that the equation for creeping flow results when the left side is assumed zero. In axisymmetric flow another stream function formulation, called the Stokes stream function, can be used to describe the velocity components of an incompressible flow with one scalar function. The incompressible Navier–Stokes equation is a differential algebraic equation, having the inconvenient feature that there is no explicit mechanism for advancing the pressure in time. Consequently, much effort has been expended to eliminate the pressure from all or part of the computational process. The stream function formulation eliminates the pressure but only in two dimensions and at the expense of introducing higher derivatives and elimination of the velocity, which is the primary variable of interest. The Navier–Stokes equations are nonlinear partial differential equations in the general case and so remain in almost every real situation. In some cases, such as one-dimensional flow and Stokes flow (or creeping flow), the equations can be simplified to linear equations. The nonlinearity makes most problems difficult or impossible to solve and is the main contributor to the turbulence that the equations model. The nonlinearity is due to convective acceleration, which is an acceleration associated with the change in velocity over position. Hence, any convective flow, whether turbulent or not, will involve nonlinearity. An example of convective but laminar (nonturbulent) flow would be the passage of a viscous fluid (for example, oil) through a small converging nozzle. Such flows, whether exactly solvable or not, can often be thoroughly studied and understood. Turbulence is the time-dependent chaotic behavior seen in many fluid flows. It is generally believed that it is due to the inertia of the fluid as a whole: the culmination of time-dependent and convective acceleration; hence flows where inertial effects are small tend to be laminar (the Reynolds number quantifies how much the flow is affected by inertia). It is believed, though not known with certainty, that the Navier–Stokes equations describe turbulence properly. The numerical solution of the Navier–Stokes equations for turbulent flow is extremely difficult, and due to the significantly different mixing-length scales that are involved in turbulent flow, the stable solution of this requires such a fine mesh resolution that the computational time becomes significantly infeasible for calculation or direct numerical simulation. Attempts to solve turbulent flow using a laminar solver typically result in a time-unsteady solution, which fails to converge appropriately. To counter this, time-averaged equations such as the Reynolds-averaged Navier–Stokes equations (RANS), supplemented with turbulence models, are used in practical computational fluid dynamics (CFD) applications when modeling turbulent flows. Some models include the Spalart–Allmaras, k–ω, k–ε, and SST models, which add a variety of additional equations to bring closure to the RANS equations. Large eddy simulation (LES) can also be used to solve these equations numerically. This approach is computationally more expensive—in time and in computer memory—than RANS, but produces better results because it explicitly resolves the larger turbulent scales. Together with supplemental equations (for example, conservation of mass) and well formulated boundary conditions, the Navier–Stokes equations seem to model fluid motion accurately; even turbulent flows seem (on average) to agree with real world observations. The Navier–Stokes equations assume that the fluid being studied is a continuum (it is infinitely divisible and not composed of particles such as atoms or molecules), and is not moving at relativistic velocities. At very small scales or under extreme conditions, real fluids made out of discrete molecules will produce results different from the continuous fluids modeled by the Navier–Stokes equations. For example, capillarity of internal layers in fluids appears for flow with high gradients. For large Knudsen number of the problem, the Boltzmann equation may be a suitable replacement. Failing that, one may have to resort to molecular dynamics or various hybrid methods. Another limitation is simply the complicated nature of the equations. Time-tested formulations exist for common fluid families, but the application of the Navier–Stokes equations to less common families tends to result in very complicated formulations and often to open research problems. For this reason, these equations are usually rewritten for Newtonian fluids where the viscosity model is linear; truly general models for the flow of other kinds of fluids (such as blood) do not exist. The Navier–Stokes equations, even when written explicitly for specific fluids, are rather generic in nature and their proper application to specific problems can be very diverse. This is partly because there is an enormous variety of problems that may be modeled, ranging from as simple as the distribution of static pressure to as complicated as multiphase flow driven by surface tension. Generally, application to specific problems begins with some flow assumptions and initial/boundary condition formulation, this may be followed by scale analysis to further simplify the problem. Visualization of (a) parallel flow and (b) radial flow. From this point onward more quantities of interest can be easily obtained, such as viscous drag force or net flow rate. This ordinary differential equation is what is obtained when the Navier–Stokes equations are written and the flow assumptions applied (additionally, the pressure gradient is solved for). The nonlinear term makes this a very difficult problem to solve analytically (a lengthy implicit solution may be found which involves elliptic integrals and roots of cubic polynomials). Issues with the actual existence of solutions arise for R > 1.41 (approximately; this is not √2), the parameter R being the Reynolds number with appropriately chosen scales. This is an example of flow assumptions losing their applicability, and an example of the difficulty in "high" Reynolds number flows. A type of natural convection which can be described by the Navier–Stokes equation is the Rayleigh–Bénard convection. It is one of the most commonly studied convection phenomena because of its analytical and experimental accessibility. Some exact solutions to the Navier–Stokes equations exist. Examples of degenerate cases — with the non-linear terms in the Navier–Stokes equations equal to zero — are Poiseuille flow, Couette flow and the oscillatory Stokes boundary layer. But also more interesting examples, solutions to the full non-linear equations, exist such as Jeffery–Hamel flow, Von Kármán swirling flow, Stagnation point flow, Landau–Squire jet, Taylor–Green vortex. Note that the existence of these exact solutions does not imply they are stable: turbulence may develop at higher Reynolds numbers. Under additional assumptions, the component parts can be separated. where A and B are arbitrary constants. This solution is valid in the domain r ≥ 1 and for A < −2ν. Some of the flow lines along a Hopf fibration. Wyld diagrams are bookkeeping graphs that correspond to the Navier–Stokes equations via a perturbation expansion of the fundamental continuum mechanics. Similar to the Feynman diagrams in quantum field theory, these diagrams are an extension of Keldysh's technique for nonequilibrium processes in fluid dynamics. In other words, these diagrams assign graphs to the (often) turbulent phenomena in turbulent fluids by allowing correlated and interacting fluid particles to obey stochastic processes associated to pseudo-random functions in probability distributions. Note that gravity has been accounted for as a body force, and the values of gx, gy, gz will depend on the orientation of gravity with respect to the chosen set of coordinates. Thus, for the incompressible version of the Navier–Stokes equation the second part of the viscous terms fall away (see Incompressible flow). This system of four equations comprises the most commonly used and studied form. Though comparatively more compact than other representations, this is still a nonlinear system of partial differential equations for which solutions are difficult to obtain. These equations could be (slightly) compacted by, for example, factoring 1/r2 from the viscous terms. However, doing so would undesirably alter the structure of the Laplacian and other quantities. The Navier–Stokes equations are used extensively in video games in order to model a wide variety of natural phenomena. Simulations of small-scale gaseous fluids, such as fire and smoke, are often based on the seminal paper "Real-Time Fluid Dynamics for Games" by Jos Stam, which elaborates one of the methods proposed in Stam's earlier, more famous paper "Stable Fluids" from 1999. Stam proposes stable fluid simulation using a Navier–Stokes solution method from 1968, coupled with an unconditionally stable semi-Lagrangian advection scheme, as first proposed in 1992. More recent implementations based upon this work run on the game systems graphics processing unit (GPU) as opposed to the central processing unit (CPU) and achieve a much higher degree of performance. Many improvements have been proposed to Stam's original work, which suffers inherently from high numerical dissipation in both velocity and mass. An introduction to interactive fluid simulation can be found in the 2007 ACM SIGGRAPH course, Fluid Simulation for Computer Animation. ^ Fefferman, Charles L. "Existence and smoothness of the Navier–Stokes equation" (PDF). claymath.org. Clay Mathematics Institute. Retrieved 2017-04-02. ^ Batchelor (1967) pp. 137 & 142. ^ a b c d Batchelor (1967) pp. 142–148. ^ Chorin, Alexandre E.; Marsden, Jerrold E. (1993). A Mathematical Introduction to Fluid Mechanics. p. 33. ^ a b Batchelor (1967) p. 165. ^ Batchelor (1967) pp. 147 & 154. ^ White (2006) p. 67. ^ Batchelor (1967) p. 75. ^ a b c See Acheson (1990). ^ Batchelor (1967) pp. 21 & 147. ^ a b Shah, Tasneem Mohammad (1972). "Analysis of the multigrid method". Nasa Sti/recon Technical Report N. 91: 23418. Bibcode:1989STIN...9123418S. ^ Landau & Lifshitz (1987) pp. 75–88. ^ Robert Bridson; Matthias Müller-Fischer. "Fluid Simulation for Computer Animation". www.cs.ubc.ca. V. Girault and P.A. Raviart. Finite Element Methods for Navier–Stokes Equations: Theory and Algorithms. Springer Series in Computational Mathematics. Springer-Verlag, 1986.